Use the form below to inquire about Picturesque Resort on Cheengeri Hills . Use the form below to reserve for Picturesque Resort on Cheengeri Hills . Air Conditioned Room, Hot and Cold Running Water, Intercom, Private Balcony/Verandah, Tea/Coffee Maker, TV with cable connection in each rooms. Ceiling Fan, Hot and Cold Running Water, Private Balcony/Verandah, Room Service, Tea/Coffee Maker, TV with cable connection in each rooms. Air Conditioned Room, Hot and Cold Running Water, Tea/Coffee Maker, TV with cable connection in each rooms. This Picturesque Resort on Cheengeri Hills is encompassed between the spectacular Chembra peak and the historic Edakkal Caves. The Resort has breathtaking views of the mountain ranges of the Western Ghats and the swirling Karappuzha river that cuts a swathe through the verdant greenery. The visual treat of mist melting against the mountain peaks is a magical sight capable of melting away every bit of stress accumulated in our mundane modern lifestyles. Your worries will float away into thin air just as the fluffy clouds in the sky. This charming Resort sits a class apart from its contemporaries because of its unique cave accommodations. The Rock Cave accommodation recreates the ambiance of a serene cave and offers a relaxing natural environment with even rocks around. The Mud Cave is a wholly natural cave that has mud plastering. The relief sculpture art here accentuates the serenity of the interiors bringing about peace of mind and body alike. The tree top wood house accommodations will keep you connected with nature at every step. Other accommodations such as luxury rooms, deluxe rooms, and standard rooms too are available. All the accommodations are decorated with contemporary furnishings and come with modern facilities for a comfortable stay. The icing on the cake at this panoramic resort is the camping tent accommodation that can be arranged at the peak of this misty hill, for you to enjoy the solitude and be enchanted. The exotic delicacies served at the in-house multi-cuisine restaurant at the Resort will scintillate all types of taste buds. Continental cuisine and local Kerala delicacies are prepared by eminent chefs. The in-house bird watching and trekking trails bring nature to your door steps. The watch tower on the premises of this Resort offers a visual treat with bird’s eye views of the stunning panorama surrounding this mountain retreat. The campfire in the evening brings about the perfect culmination to a day in a dreamy and charming setting. Rates are in Indian Rupees per room per night including complimentary breakfast. Cable TV & telephone in all rooms. There will be 25% hike in tariff from Dec 21st to Jan 5th. Weekdays: Monday, Tuesday, Wednesday & Thursday. Weekend: Friday, Saturday & Sunday. The rooms would be held until 8 PM in case of confirmed reservation. Need prior intimation for extension of stay. 25% if canceled 10 days in advance. 50% if few of the total booked rooms are canceled. 100% if canceled one day prior to booking or on the same day. 25% if canceled 30 days in advance. 100% if canceled 05 days in advance or later. Bird watching and trekking points inside the resort premises allow the guests to begin their nature expeditions as soon as they step out of their accommodations. The indoor and outdoor game facilities at the Resort offer you a variety of activities to choose from. 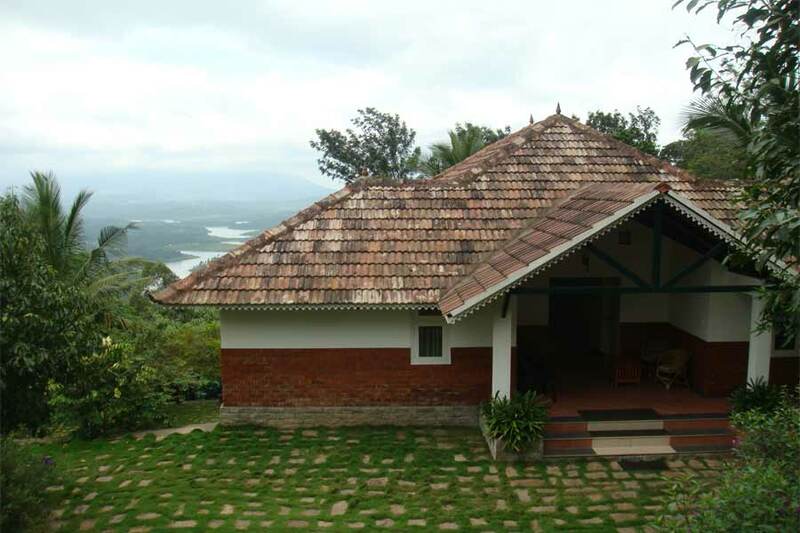 All major hot spots of Wayanad are at proximity from the resort. The historic Edakkal Caves with stone carvings as old as two centuries are at a stone’s throw away from the Resort. Visit Kaduvakuzhi, a dark underground cave with a wondrous water body inside. Pay a visit to Thirunelli temple and the sacred Paapanashini River. Be awestruck at the Phantom Rock, a rock that resembles the shape of a skull. Explore the spices, fruits, vegetables, and hill paddy at the Regional Agriculture Research Station or witness the tribal artifacts at the Ambalavayal Heritage Museum. Fishing in the mountains is a rare indulgence but is possible at the Karapuzha Dam. This dam catchment is also abundant with numerous bird species and butterflies. Pakshipadalam is another bird watching haven. The placid waters of Pookkote Lake are perfect for a tranquil cruise in a boat. The largest earth dam in India, the Banasura Sagar Dam is a picturesque setting amidst mountains, valleys, tiny islands and water bodies. Here, aside from the speed boating thrill, experience the enthralling excitement of trekking to the Banasura Mountains. Spectacular waterfalls like Soochippara and Meenmutti will not only mesmerize you with their beauty and force but add adventure like trekking to the top and the thrill of waters sports in the pool below. Chembra Peak, Sunrise Valley, and Lakkidi are high points atop which you can soak in the beauty of Wayanad from a vantage point. Kuruva Island and Muthanga Wildlife Sanctuary will take you up close with raw nature and its majestic beings. Distance from Bangalore is 310 km (appx 5 hrs) and distance from Mysore is 162 km (appx 3 hrs). Calicut is the nearest airport at a distance of about 95 km (appx 2 hrs). Ooty is at 102 km (appx 2 hrs) while Coorg is about 126 km (appx 2.5 hrs) away. Kannur is around 126 km (appx 2.5 hrs) away and Cochin International Airport is 237 km (appx 4.5 hrs) away. Located atop an elegant hill, this beautiful resort is a little piece of paradise on earth. Tranquil and totally in harmony with nature, the melodious tunes of birds and the soft breeze rustling through the leaves are the only interruptions you will encounter. The breathtaking view from the rooms offers you glimpses of Karaphuza Dam Lake and the resplendent hills. The rooms are spacious, neat, and equipped with all basic amenities. The cave rooms—one artificial and one natural—deserve a special mention since they offer you the opportunity to experience luxury in a cave! The room inside the natural cave comes with your own personal waterfall. Excellent hospitality and a courteous staff who are always ready to cater to your needs as best possible enhance the experience. Hiking trails abound and offer excellent views alongside the peace and serenity. The approach to the resort is an adventurous one and also scenic. It preps you for the beautiful spectacles that await you a little ahead at this amazing resort. A must visit!